The most successful revue in the history of SA returns for the Festive Season! 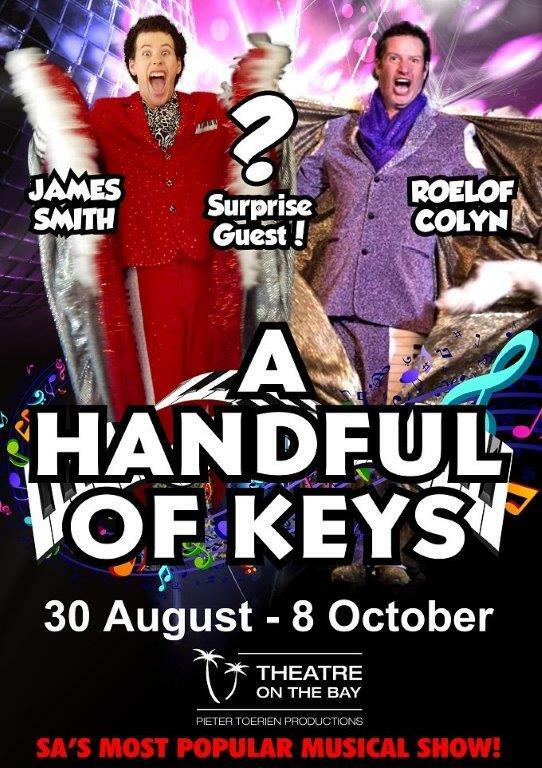 The virtuoso talents in this 2017 edition of the show are Roelof Colyn, a stalwart of A HANDFUL OF KEYS since 2001 who is beloved by audiences for his effortless charm, dead pan wit and the liquid magic of his playing, and nineteen-year-old James Smith the youngest person ever, to appear in the review. Pay only HALF PRICE by joining our unique THEATRICS CLUB Find out more/Sign up here! There is no age restriction and this production is recommended and advised for the whole family! There are great discounts for SENIORS and SCHOLARS for all performances available from kiosks only. GROUPS and CHARITIES/FUND RAISERS can benefit form a host of great discount options. Pay only HALF PRICE by joining our unique THEATRICS CLUB! Find out more/Sign up here!